Everyone knows buying in bulk can save you money. Paving city streets may not be any different. Contractors tell us that one larger contract is more attractive than several smaller ones and can save the end user money. Unfortunately, many smaller municipalities can never reach the level required to achieve costs savings on their own. This year, The Kleingers Group, in coordination with the Center for Local Government, will premier one of the first multi-jurisdictional pavement improvement plans, combining paving needs from three communities into one project. The idea is that three communities—Silverton, Amberley Village and Golf Manor—are more likely to attract a competitive bid and get better pricing with a combined request for proposal than individually. There are numerous benefits to the three communities working together. For starters, the communities can share small costs, such as printing and advertising, almost immediately. The cost of asphalt is cheaper when purchased in large quantities. Another real cost savings comes from transporting the very large paving equipment to the site. Since Silverton, Amberley Village and Golf Manor are all neighboring communities, the contractor selected for the project will be able to transport equipment to the area once, completing the needed repairs in all three communities without incurring the cost of transporting equipment multiple times. The result is a RFP that is more attractive to contractors and potentially cheaper for the communities involved. The Kleingers Group has created combined bid documents previously. Last year, Kleingers coordinated two nearby improvement projects—one in Deer Park, one in Silverton—into one set of bid documents. Although the documents were created so they could be two individual sets, they were released as one document, producing a more attractive package for contractors and creating more competition. Following that success, The Center for Local Government approached the Kleingers Group to discuss additional ways to help create coordination between local governments and began exploring multi-jurisdictional pavement improvements. The Kleingers Group participated in a series of meetings to examine the possibility, bringing Silverton, Amberley Village and Golf Manor on board. As a result of the meetings, an intergovernmental agreement (IGA) was drafted between the three communities agreeing that Silverton will hold the contract with the roadway contractor for work to be done in all three of the communities and will be reimbursed by the other two communities for the costs. While Silverton will hold the contract and administer the construction, each community will prepare its own plans, have its own inspector, and approve the work completed. The Kleingers Group and each of the three communities ensured their paving projects were as homogenous as possible. 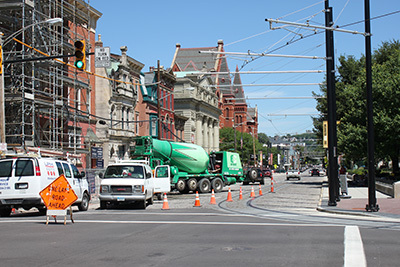 This coordination included using standard Ohio Department of Transportation asphalt mixes, consistent special provisions and material testing standards. The result is the contractor doesn’t have use a different set of standards in each community, which would have increased costs. Moving forward, The Kleingers Group hopes to not only add communities to the Silverton/Amberley Village/Golf Manor paving program, but to also look at working with other Southern Ohio communities to cluster their paving programs. Silverton Mayor John A. Smith emphasized the need to share services and cooperate with neighboring jurisdictions, even as Silverton retains its own identity. “Our residents have told us clearly: we don’t want to merge with another community and lose Silverton’s identity and self-governance. For Silverton, partnering with neighbors like Deer Park and Amberley Village has always been a priority. Today, though, it is essential. We have find even more ways to pool our resources and cooperate. Paradoxically, it is only by working together on projects like this that we can preserve our communities and determine for ourselves how to self-govern,” he said. Construction documents for the project will be sold March 9 and bids will be opened March 23.